Prostatic adenocarcinoma is a common disease with approximately one man out of seven being diagnosed within his lifetime. It is the second leading cause of cancer deaths in American men. Most patients are asymptomatic and lung symptoms are very rare. We present a 52-year-old male with a 3-month history of cough, shortness of breath, and weight loss with clinical and radiological findings suggestive of a primary lung disease, who was found to have prostatic adenocarcinoma in a bronchoalveolar lavage (BAL) specimen. This unusual presentation highlights the importance of clinical history, laboratory data, and immunocytochemistry in diagnostic cytopathology. A 52-year-old male with no past medical history presented to our institution with a 3-month history of shortness of breath, severe cough without sputum production, fatigue, and a 6.8 kg weight loss over the past 3 months. Review of symptoms was significant for burning on urination. Chest x-ray demonstrated bilateral interstitial and alveolar opacities mainly in the mid to lower lobes with blunting of the costophrenic angles. Computed tomography (CT) of the chest demonstrated multiple diffuse foci of consolidations and nodules, predominantly subpleural and located in the lower lobes, and diffuse interlobular septal thickening and peribronchial thickening. Cystic fluid-density lesions in the left kidney prompted further abdominal imaging. A CT of the abdomen demonstrated left-sided hydronephrosis and hydroureter with thickening of the proximal and mid left ureter with soft tissue filling defect within the lumen, thickened with focal hyperdensities along the lateral walls of the bladder, enlarged, heterogeneous appearing prostate with compression against the posterior and inferior urinary bladder wall, and bilateral, necrotic enlarged lymph nodes measuring up to 3 cm. On admission, the patient's prostate-specific antigen (PSA) was reported as >5,000 ng/mL. Subsequently, the patient underwent bronchoscopy with BAL and middle lobe-lateral segment transbronchial biopsy. The patient was found to have metastatic prostatic adenocarcinoma to the lung and was started on androgen-deprivation therapy with bicalutamide. As an outpatient, he receives monthly leuprolide (Lupron) injections. BAL was obtained using a flexible fiberoptic bronchoscopy, the recovery sample was received in saline and mucolytic agent and preservative (Saccomanno) was added. Sample was centrifuged and two drops of the supernate were placed on the glass slide. Two slides were prepared and immediately fixed in 95% isopropyl alcohol. The slides were stained by the Papanicolaou (Pap) method. Immunocytochemistry was performed directly on one slide without the destaining procedure. Briefly, the slides were rehydrated in descending grades of ethanol. The endogenous peroxidase activity was blocked using 6% hydrogen peroxide. The slide was immersed in target retrieval solution (DM828, DakoCytomation) and heated at 90°C in a vegetable steamer for 10 min to achieve optimal epitope retrieval, after placing the slide buffer for 5 min. The slide was incubated with primary antibody, PSA (rabbit polyclonal, Dako, RTU). Hematoxylin was applied to the slide as a counterstain. Alveolar lavage cytospin slides showed three-dimensional cohesive, round cluster of cells with smooth borders admixed with acinar-forming structures in a background of alveolar macrophages. The cells were small with scant cytoplasm and the nuclei were eccentrically or centrally located with fine chromatin. The cells were positive for PSA immunostain [Figure 1]a-c]. The corresponding histology specimen demonstrated acinar pattern in a background of dense fibrous tissue [Figure 1]d]. These cells were also positive for PSA, confirming the diagnosis of metastatic prostatic adenocarcinoma. When prostatic adenocarcinoma metastasizes it usually spreads via lymphatics, with the most common locations being the regional lymph nodes and the bones of the pelvis and axial skeleton. Involvement of the lung is not as common. While there have been many autopsy studies finding a high prevalence of lung metastases, such as Bubendorf et al. who found 46%, clinically apparent lung metastasis has been quoted between 4% and 27%. , When prostatic adenocarcinoma does spread to the lungs, it usually occurs in advanced disease. Metastatic deposits are typically located on the visceral surfaces,  making it unlikely for tumor cells to be present in a BAL specimen. Other unusual locations include nose and paranasal sinuses, kidney, testis, skin, and breast. , These unusual locations of metastatic prostatic adenocarcinoma highlight the significance of knowing clinical history for accurate diagnosis and quality patient care. PSA antibody immunostain has changed the ability to diagnose adenocarcinoma of an unknown primary site. This antibody is specific for prostatic adenocarcinoma, and its utility in diagnosing prostatic adenocarcinoma in tumors of unknown etiology has been utilized for decades. 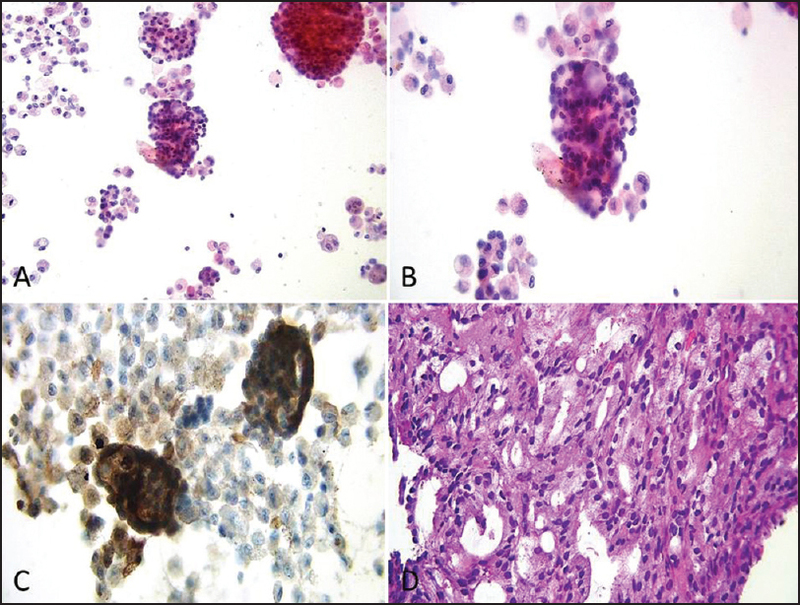 We presented an unusual case of metastatic prostatic adenocarcinoma in the lung diagnosis rendered cytologically and confirmed by the use of immunocytochemistry for PSA on a previously alcohol-fixed Pap-stained cytospin slide. Cancer.org. American Cancer Society, Inc.; c2014. Available from: http://www.cancer.org/cancer/prostatecancer/detailedguide/prostate-cancer-key-statistics. [Last accessed on 2014 Dec 24]. Epstein JI, Algaba F, Allsbrook WC Jr, Bastacky S, Boccon-Gibod L, De Marzo AM, et al. Acinar adenocarcinoma. In: Eble JN, Sauter G, Epstein JI, Sesterhenn IA, editors. World Health Organization Classification of Tumours: Pathology and Genetics of Tumours of the Urinary System and Male Genital Organs. Lyon: IARC Press; 2004. p. 162-72. Kaye DR, Walsh PC, Netto GJ, Gonzalez-Roibon N, Rodriguez R. A 66-year-old man with prostate-specific antigen recurrence and lung mass after radical prostatectomy. Urology 2012;80:247-9. Tohfe M, Baki SA, Saliba W, Ghandour F, Ashou R, Ghazal G, et al. Metastatic prostate adenocarcinoma presenting with pulmonary symptoms: A case report and review of the literature. Cases J 2008;17:316. Verstraeten A, Sault MC, Wallaert B, Lemonnier P, Gosselin B, Tonnel AB. Metastatic prostatic adenocarcinoma-diagnosed by bronchoalveolar lavage and tumour marker determination. Eur Respir J 1991;4:1296-8. Saleh HA, O'Flynn P, Jones NS. Prostatic metastases in the nose and paranasal sinuses. J Laryngol Otol 1993;107:629-32. Nadji M, Morales AR. Immunohistochemical markers for prostatic cancer. Ann N Y Acad Sci 1983;420:134-9.